The list of cat breeds poster was the result of my nonfiction book project about the domestic cat (Latin: Felis catus). The book includes cat's anatomy, cat breeds and cat health and welfare. 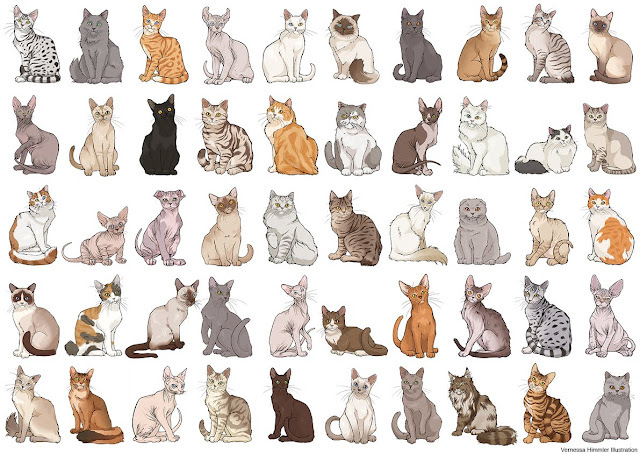 For the cat breeds collection of the book, I illustrated 220 cats. The poster shows 50 of these domestic cat breeds and show the most exotic and rare short-hair and long-hair cats from all over the world. The list includes established breeds recognized by various cat registries, new and experimental breeds. There are more than 70 cat breeds, though different associations proclaim different numbers according to their standards.